BARK BARK BARK – August 3rd. 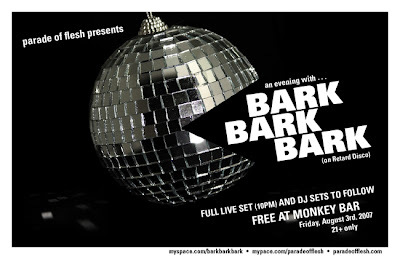 Arizona’s Bark Bark Bark will be making an appearance for us at Monkey Bar. The show is FREE and they will play a full set sometime after 10PM and then all the band members will dj after. This entry was posted on July 22, 2007 at 3:45 pm, filed under News.